As winter sports athletes are attempting to close out their seasons, the spring sports are just getting started. And while some members of the track and field team set personal bests and both baseball and softball hit the diamond with winning weekends, both Panthers basketball squads and the tennis team experienced major losses. Pitt softball travelled to Conway, South Carolina, this weekend to partake in the Chanticleer Showdown. The team split two games each with Georgetown and Saint Joseph’s but bested Coastal Carolina in its single matchup. In the first outing against Georgetown, the Panthers claimed a 2-0 victory. Senior Kayla Harris pitched a complete game, featuring four perfect innings. Sophomore Kaitlyn Kruger had a home run in the opening frame and the team’s first RBI, senior Giorgiana Zeremenko grabbed the other RBI in the final inning. In its first game against Saint Joseph’s, Pitt claimed a hearty 7-1 victory. Junior Sarah Dawson and sophomore Brittany Knight allowed only one run from the circle, while junior Marissa DeMatteo led the team with two RBIs. Against Georgetown, the team met defeat, losing 5-3. Zeremenko had all three RBIs and a home run, with Kruger assisting offensively, registering two hits. Taking on Coastal Carolina later in the day Saturday, the Panthers won 4-3. Kruger and senior Erin Hershman both had home runs as Dawson threw a complete game, tallying a career-high seven strikeouts. Despite scoring five runs in the top of the first inning, the Panthers fell 8-6 against Saint Joseph’s in their last game on Sunday. The team had its best offensive outing of the season, but it was not enough to make up for Saint Joseph’s offensive strength. Zeremenko went 3-4 with a home run, and junior Gabrielle Fredericks, junior Alexis Solak and first year Hunter Levesque all registered two hits. Sophomore Alexee Haynes had two RBIs. After the weekend, the team’s record sits at 8-5-1 overall. Pitt opens ACC play this weekend with three games in Raleigh, North Carolina, against NC State. Pitt baseball was in Spartanburg, South Carolina, this weekend for the Wofford-USC Upstate tournament. The team squared off against Presbyterian, USC Upstate and Seton Hall, winning two of the three matchups. Facing Presbyterian, the Panthers took their first win, 4-3. Redshirt sophomore David Yanni’s two-run shot in the fifth inning gave Pitt a lead the team kept for the remainder of the game. Sophomore Dan Hammer got the start at pitcher, giving up two runs and six hits and striking out four batters during his five innings on the mound. After stepping in to finish the game for Hammer, junior Yaya Chentouf struck out three and allowed one run. Redshirt junior Liam Sabino powered the squad to a 3-1 win over USC-Upstate Saturday. Sabino went 3-5 with two homers and all three RBIs — his two-run home run in the top of the ninth proving to be the difference-maker. Redshirt senior Matt Pidich went 5.2 innings, allowing six hits and one run and striking out eight. Chentouf tallied another save, throwing 2.1 scoreless innings. The Panthers ended the weekend with a shutout 1-0 loss to Seton Hall. A Pitt throwing error gave the Pirates the only run of the game. Junior Blair Calvo started on the mound for the Panthers, throwing six scoreless innings. He gave up four hits and two walks and struck out eight. Calvo has yet to allow a run this season. After going 2-1 this weekend, the Panthers improved to 5-2 overall. Next weekend they will be in Florida, playing in the Sunshine State Classic against Massachusetts, Butler and Saint Peter’s. This weekend in South Bend, Indiana, Pitt tennis fell 4-0 to ACC opponent Notre Dame, moving the team to 5-3 on the year and 0-2 in ACC play. After Notre Dame won the doubles point and the opening singles matches, the win was unattainable for the Panthers. Panthers duo junior Luisa Varon and first year Claudia Bartolome turned in the first doubles win of the day, but the Fighting Irish ultimately clinched the point. Junior Natsumi Okamoto then fell at No. 6 singles, 6-3, 6-1, to give the Irish a 2-0 lead. Varon dropped a 6-3, 6-1 decision at singles, and junior Gabriela Rezende also fell, 6-0, 6-3. Action concluded after Notre Dame won the match. The tennis team will also be heading to Florida this weekend as they take on ACC opponents Miami and No. 19 Florida State. Pitt lost to No. 14 Nebraska by 2.825 points Saturday night in a road meet in Lincoln. Pitt recorded five top-five scores, but they were not enough. First-year Haley Brechwald and sophomore Deven Herbine both placed top five in vault. Brechwald tied her season-high score with a 9.850, and Herbine registered a career high of 9.825. Sophomore Lucy Jones tied for fourth on bars with a 9.800. Senior Catie Conrad had the same score on beam, tying for second in the event. Sophomore Alecia Petrikis took fourth on floor with a 9.825. Brechwald was the only all-around competitor for the Panthers, placing last out of three with a 39.150. The Panthers will return to the Fitzgerald Field House next Sunday at 2 p.m. as they take on rivals West Virginia and Penn State. Pitt Men’s swimming and diving partook in the 2018 ACC Men’s Swimming and Diving Championships at the Greensboro Aquatic Center in North Carolina on Saturday, setting records and placing multiple athletes. Sophomore Brian Ramsey set a school record in the Saturday morning races in the 200m breaststroke with a swim of 1:56:04. His time qualified him for the 200m finals during the evening, where he placed 12th with a time of 1:57:02. Read the full story online at here. Though some Pitt runners brought home personal bests from the ACC Indoor Track and Field Championships this weekend in Clemson, South Carolina, the men’s and women’s teams both struggled overall. 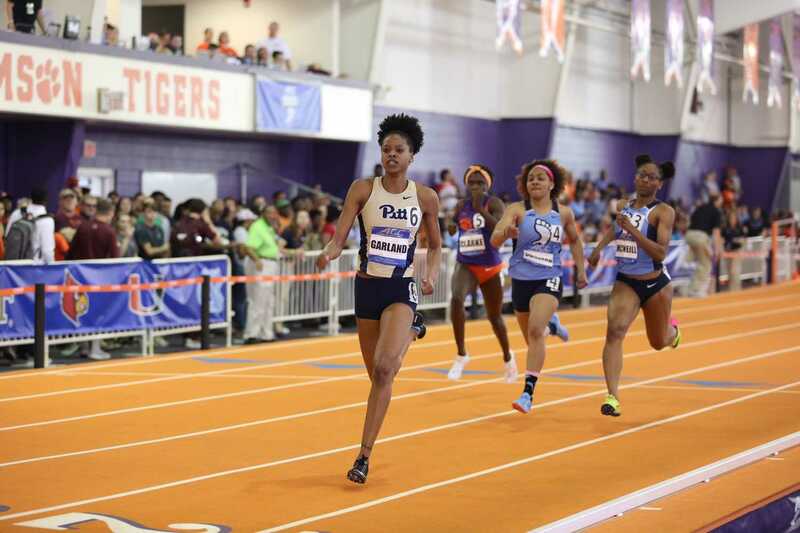 Senior Desiree Garland made program history Saturday, earning Pitt’s first-ever ACC women’s indoor track and field gold medal. The No. 1 Virginia Cavaliers secured their third ACC regular season title in the last five years Saturday afternoon. The Panthers also continued to set records, extending their losing streak to 17 in a loss against the best team in the nation. Despite low attendance this season, fans filled the lower level of the Petersen Events Center to watch Pitt (8-22 overall, 0-17 ACC) fall to Virginia (27-2 overall, 16-1 ACC) 66-37 in its last home game of the season.